Crabapple trees (Malus spp.) create a showy display throughout much of the year. In the spring, they explode with fragrant blooms that cover the trees for up to two weeks. In the late summer and fall, the leaves change color, and the trees develop an abundance of small crabapples that can be left for wildlife to enjoy or harvested for home use. If you harvest the fruit, proper timing helps you get the most from your crabapple tree. Crabapples and apples are essentially the same fruit; the only real distinction is the size. Crabapples are 2 inches or less in diameter; apples are larger than 2 inches. 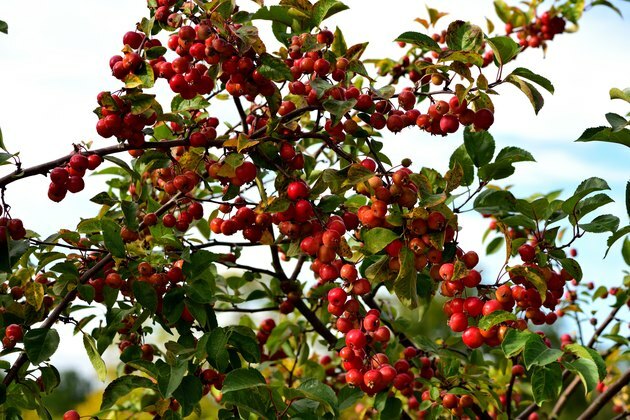 Crabapples typically thrive in U.S. Department of Agriculture plant hardiness zones 4 to 8, but some, such as Malus "Rescue," can handle the conditions in USDA zone 1. Most crabapples aren't as sweet as apples but instead have a tart, tangy flavor that many people enjoy. There are many things to do with crabapples. While they can be eaten raw, people often choose different crabapple uses and recipes, such as making juice or jelly from them or putting them up as preserves or pickles. Knowing when crabapples are ripe helps those recipes turn out better with fruit that tastes better. One of the best ways to tell if crabapples are ripe is to cut a few in half and look at the seeds. A ripe crabapple normally has dark brown seeds. If it's not ripe, the seeds are lighter in color and may look beige, greenish or white. In a few cases, the seeds may remain light, so it's best to use more than just this one method to determine ripeness of crabapple tree fruit. Different varieties of crab apples are different colors at maturity. If you know the variety of the tree you're harvesting, you can tell when they're ripe or nearly ripe by the intensity of the color. Colors can range from various shades of red to yellow and green. Many, such as Malus "Camzam" Camelot are varying shades of red, but others like Malus "Trailman" are mottled with green. Both of these varieties grow best in USDA zones 4 to 8. Some may even be solid green, like Malus "Norhey," which grows in USDA zones 1 through 8. With at least 1,000 different varieties of crabapples to choose from, you may need to wait and see what color your crabapples turn if you don't know which type you have. The firmness and flavor of the apple can also help you determine when it's ripe. Crabapples are ideal when the flesh is firm and crisp, but they should be easily edible and not so hard that you struggle to take a bite. Ripe crabapples are typically a mix of tart and sweet. If they aren't ripe yet, they taste bitter. Testing an apple that appears ripe based on color for firmness and flavor can help you decide if they're ready to harvest. The weather impacts the flavor of your harvested crabapples, so paying attention to the temperatures and weather forecast can help with your harvesting time. Crabapples that grow through cold night temperatures while daytime remains warm and sunny are often sweeter when you harvest them. But you don't want to wait too long or let the weather get too cold before harvesting. Your harvest will be at its best if you pick your crabapples before they're exposed to a hard freeze. Crabapples can tolerate temperatures down to about 27 degrees Fahrenheit, especially when the tree still has leaves on it to give them some protection. If you harvest after a freeze, wait until the crabapples are no longer frozen before handling them to avoid damaging the fruit. What Do Elderberries Taste Like?